We have created a risk-free integration process, follow these 3 simple steps to start your Arcad experience. 1. Register to create an account. 2. Install Arcad SmileStudio software. 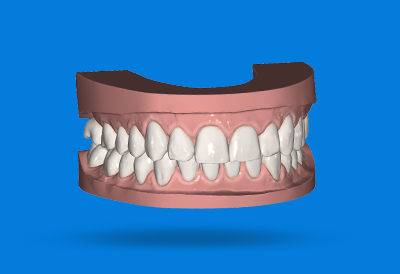 Arcad is a computer-guided system that integrates the digital or physical impression of the patient for a treatment plan design for Fast and Effective removable Clear Aligners or Fix Indirect Bonding devices. It allows you to predict dental movement and achieve higher results in the shortest possible time. Obtain results that clearly exceed quality, speed and aesthetics over other systems that use manual processes. Upload your patient scans and Arcad will create the initial treatment design. With the help of Arcad's Align Design 3D software, you have full control of the treatment review and design. Upon approval of treatment design, Arcad will prepare the series of ready to print 3D files for your in-office 3D printer, or simply ask us to print them for you. Treatment plan design as recommended by the orthodontist and with it, the ability for the orthodontist to make small modifications to the digital treatment plan setup, using the Arcad's Align Design 3D software. Keeping you in control of the outcome. Precision, speed, prediction of tooth movement, and in addition patients will enjoy reduced treatment time, fewer office visits, and a comfortable bracket placement experience.. Flexible solution that allows you to define work processes in steps and streamline production process to meet customer demand. Use any open source intraoral scanner to take extremely precise and high-resolution digital impressions of your patients. Upload your digital impressions through our Arcad client web portal. Admission of digital files and online laboratory prescription. Once the necessary records are loaded, a suggested bracket or digital aligner setup is processed. A digital treatment solution is created and available for doctor review. With the use of Arcad SmileStudio software the doctor can review, modify and approve the configuration. Once approved, Arcad will prepare the sequence of 3D print ready files, compatible with most 3D printers in .STL file format. With the Arcad a-la-cart solution, you can choose your printing options. Preparation of 3D printing files and files available to download for In-Office solution. Production of 3D printed models and shipping for the In-Lab solution. ArcadLab will produce the indirect bond trays with a custom base and a 2 piece delivery system. Manufacturing and Shipping of the indirect bonding trays and / or Aligners. Order delivery of appliance to your office. "No podría estar más satisfecho con sus productos, servicio al cliente y atención"
"Un producto final que cumple con todas las expectativas de nuestra oficina y la mejora de la calidad de nuestra eficiencia de tratamiento"
"Con Arcadlab Indirect Bonding, puedo tratar a mis pacientes de una manera más eficiente".